Great for hikers and campers who need to pack light but need multiple purpose gear. 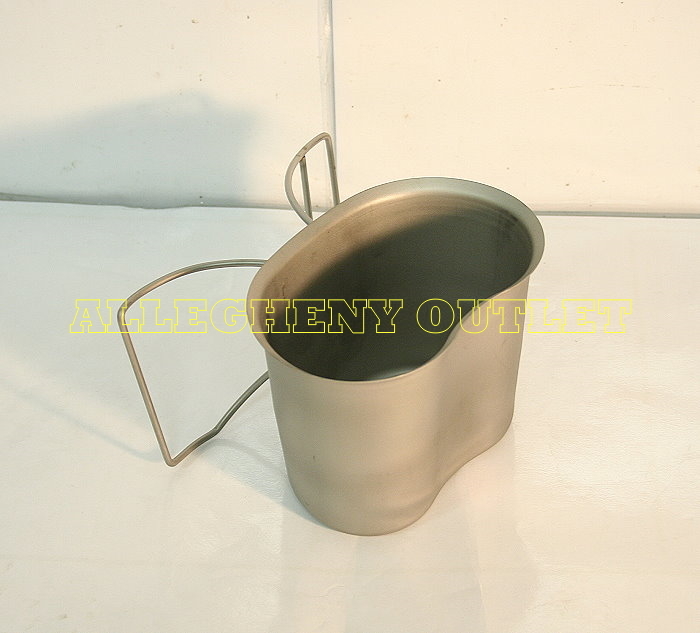 These are made out of Stainless Steel (non ferrous) making cleanup easy and no worries of oxidation or heat damage. You can drink beverages from these, cook your rations in them, burn heat tabs in them for a small compact heater, use them for radio reception boost, early warning rattle devices, dig a foxhole, you can even use them for weapons in hand to hand combat, however I recommend the most common use of mixing water, coffee and cocoa over heat for a nice Hot Mocha or heating a nice Hot can of soup. Another common use is simply a collector's item, but either way, you just can't beat a beverage container, sauce pan, heater, antenna booster, alarm, shovel, Stainless Knuckles, Soup pot of a collectors item for these prices. Heat sources, Fluids, rations, radio, coffee , cocoa and soup not included.